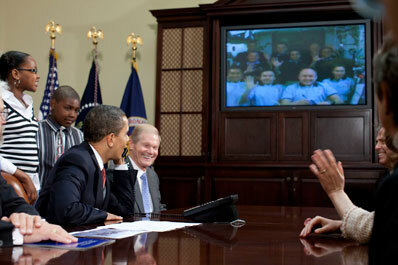 President Barack Obama, hosting school kids and members of Congress, called the crews of the shuttle Discovery and the international space station today, quizzing the astronauts about life in space and offering congratulations for a successful station assembly mission. 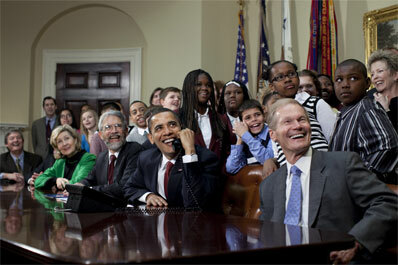 Calling from the White House as the shuttle-station complex sailed 220 miles above the southern tip of South America, Obama chatted easily, relaying questions from school children and fellow law makers. "Hello, commander, can you hear us?" Obama called. "Mr. President, welcome aboard the international space station where we are joined with our international crew from the space shuttle Discovery," commander Mike Fincke replied. "Welcome aboard, glad to hear your voice, we hear you loud and clear, sir." "Well, thank you so much for taking the time to speak with us," Obama sad. "We've got a crew of wonderful school children here who are all interested in space and we've got some members of Congress who are like big kids when it comes to talking to astronauts. I'm told you're cruising at about 17,000 mph so we're glad you are using the hands-free phone." "Mr. President, we go around the planet once every 90 minutes. It's quite a thrill and it is very fast. We see 16 sunrises and 16 sunsets every day." "That is unbelievable," Obama said. "Well, the first thing we want to do is just let you know how proud we are of you." The seven-member shuttle crew - commander Lee Archambault, pilot Dominic "Tony" Antonelli, John Phillips, Sandra Magnus and spacewalkers Steven Swanson, Joseph Acaba and Richard Arnold - joined Fincke, flight engineer Yury Lonchakov and Koichi Wakata in the station's Harmony connecting module to take the presidential phone call. Discovery's crew delivered and installed a fourth and final set of solar arrays for the space station, a new urine processor system centrifuge and Wakata, Japan's first long-duration astronaut. He replaced Magnus, who will return to Earth aboard Discovery after four months in space. Swanson, Acaba and Arnold carried out three spacewalks and while they accomplished all of the mission's primary objectives, they were unable to deploy an external cargo platform when its mechanism jammed. As a result, deployment of a second storage platform was deferred, along with work to re-wire an electrical patch panel. If all goes well, the shuttle will undock from the station at 3:53 p.m. Wednesday. After a final heat shield inspection Thursday, the astronauts will pack up and return to the Kennedy Space Center Saturday, landing around 1:43 p.m.
"We are really excited about the project you are doing," Obama radioed. "This is really exciting because we're investing back here on the ground (in) a whole array of solar and other renewable energy projects. And so, to find out you're doing this up at the space station is particularly exciting." After asking how the astronauts installed the station's new arrays, the president said "obviously, we're really proud about the extraordinary work our American astronauts are doing. You are representative of the dedication and sense of adventure and discovery that we're so proud of. "But one of the things that's so wonderful about this is that it is an international space station and I know we have our Japanese and Russian counterparts on board as well. We'd love to say hello to them and hope this is an example of the kind of spirit of cooperation we can apply not just in space but here on the ground as ell." "It's an honor to have a chance to talk with you, Mr. President," Wakata replied. "We have a Russian crew member, and American crew member and I'm from Japan. We have 16 countries working together in this wonderful project, the international space station. ... It really symbolizes the future of the scientific development of the world. And I'm just happy to be part of this." Said Lonchakov, a Russian cosmonaut: "Mr. President, we work together to do everything. It's really, really important for us." Obama quizzed the astronauts on the research being conducted on the station, asking how much time the crew spends on science and simply maintaining the outpost. "Well sir, we have experiments already up here that we've been doing for many years, we'll be able to double that with the addition of the solar array that our shuttle friends brought up. We do a lot of experiments on combustion, understanding materials. You know, we're guinea pigs, so understanding how people's bodies change in space. All this is in preparation for long-duration missions to moon and Mars. "And the exciting thing about doing science up here is we really don't know what we don't know. And that gives you the greatest potential for learning. And we've had a lot of cases where people have sent up experiments and we've conducted them here on the space station only to find out we've learned something new, something more about the fundamentals about the processes and the science. So it's a really great place to learn a lot." Magnus wears her hair long and it floats out in zero gravity. Obama asked, "were you tempted to cut your hair shorter while you were up there?" "That's a really good question," Magnus replied. "Because there's a little bit of overhead to take care of long hair here. I think ideally, a short haircut's the way to go but quite frankly, on me it wouldn't be so nice. So I kept it long." "I think it's a real fashion statement," Obama laughed.